On paper, it doesn't seem like Christopher Wolverton's super lithium-rich battery should work. For one, the novel battery uses iron, an inexpensive metal that has notoriously failed in batteries. 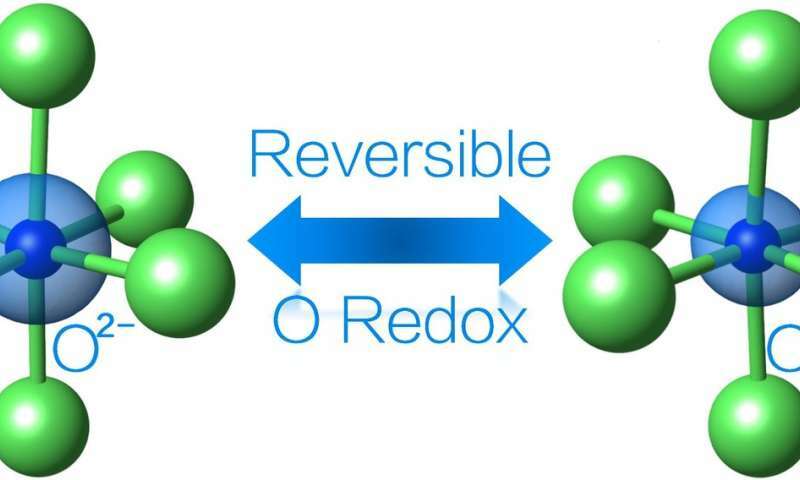 And in another difficult feat, the battery leverages oxygen to help drive the chemical reaction, which researchers previously believed would cause the battery to become unstable. Teaming up with researchers at Argonne National Laboratory, Wolverton's group at Northwestern University developed a rechargeable lithium-iron-oxide battery that can cycle more lithium ions than its common lithium-cobalt-oxide counterpart. The result is a much higher capacity battery that could enable smart phones and battery-powered automobiles to last much longer. "Our computational prediction of this battery reaction is very exciting, but without experimental confirmation, there would be a lot of skeptics," said Wolverton, professor of materials science and engineering in Northwestern's McCormick School of Engineering. "The fact that it actually works is remarkable." Supported by the US Department of Energy's Energy Frontier Research Center program, the research was recently published in Nature Energy. Zhenpeng Yao, a PhD student in Wolverton's laboratory, and Chun Zhan, a postdoctoral fellow at Argonne, served as the paper's first authors. Wolverton and Yao led the computational development, and Argonne led the experimental component of the research. "In the conventional case, the transition metal is doing the reaction," Wolverton said. "Because there is only one lithium ion per one cobalt, that limits of how much charge can be stored. What's worse is that current batteries in your cell phone or laptop typically only use half of the lithium in the cathode." The lithium-cobalt-oxide battery has been on the market for 20 years, but researchers have long searched for a less expensive, higher capacity replacement. Wolverton's team has improved upon the common lithium-cobalt-oxide battery by leveraging two strategies: replacing cobalt with iron, and forcing oxygen to participate in the reaction process. "The problem previously was that often, if you tried to get oxygen to participate in the reaction, the compound would become unstable," Yao said. "Oxygen would be released from the battery, making the reaction irreversible." Through computational calculations, Wolverton and Yao discovered a formulation that works reversibly. First, they replaced cobalt with iron, which is advantageous because it's among the cheapest elements on the periodic table. Second, by using computation, they discovered the right balance of lithium, iron, and oxygen ions to allow the oxygen and iron to simultaneously drive a reversible reaction without allowing oxygen gas to escape. "Not only does the battery have an interesting chemistry because we're getting electrons from both the metal and oxygen, but we're using iron," Wolverton said. "That has the potential to make a better battery that is also cheap." And perhaps even more importantly, the fully rechargeable battery starts with four lithium ions, instead of one. The current reaction can reversibly exploit one of these lithium ions, significantly increasing the capacity beyond today's batteries. But the potential to cycle all four back and forth by using both iron and oxygen to drive the reaction is tantalizing. "Four lithium ions for each metal—that would change everything," Wolverton said. "That means that your phone could last eight times longer or your car could drive eight times farther. If battery-powered cars can compete with or exceed gasoline-powered cars in terms of range and cost, that will change the world." Wolverton has filed a provisional patent for the battery with Northwestern's Innovation and New Ventures Office. Next, he and his team plan to explore other compounds where this strategy could work. The major players involved in the lithium ion battery market are LG Chem Ltd. (South Korea), Panasonic Corporation (Japan), Samsung SDI Co., Ltd. (South Korea), BYD Co. Ltd. (China), BAK Group (China), A123 Systems, LLC. (U.S.), GS Yuasa Corporation (Japan), Hitachi, Ltd. (Japan), Johnson Controls Inc. (U.S.), Saft Groupe S.A. (France), Toshiba Corporation (Japan), and Valence Technology Inc. (U.S.). Factors that are driving the growth of the market include increase in demand for electric vehicle (EV), strict government mandates on fuel economy, growing demand for smart devices and other consumer electronics, and development toward enhancement of lithium ion batteries.